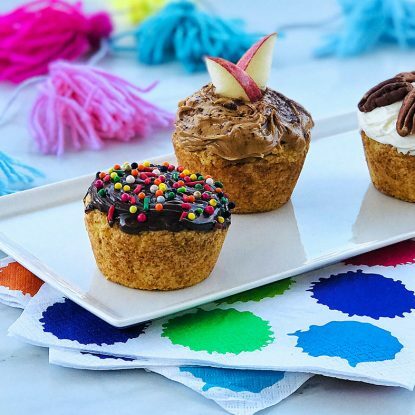 Looking for a dessert that will please both the adult and kid table? 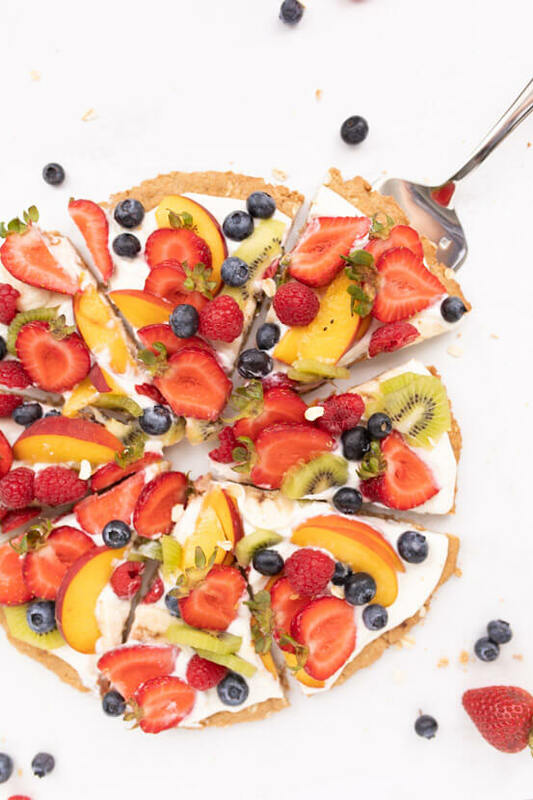 This Healthy Fruit Pizza fits the bill. Pretty enough to serve at a dinner party and fun enough to sneak in some fresh fruits for the kids. 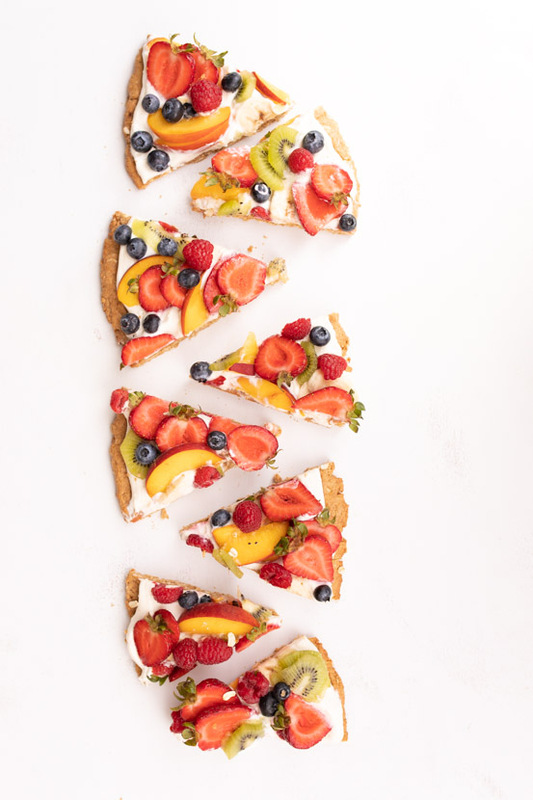 This healthy dessert pizza is a win win! Summer is all about cookouts, parties, lazy days by the pool, and of course fresh food! Your really can’t beat summer’s fresh fruits and veggies! Not only do they add beautiful color and taste to your dishes, they also add antioxidants, vitamins, and minerals. 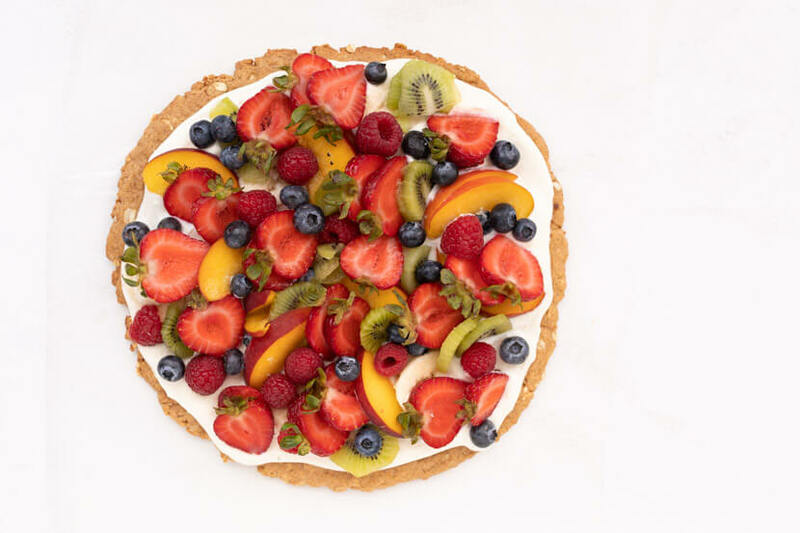 This healthy fruit pizza is packed with some of the summer’s best fruits. 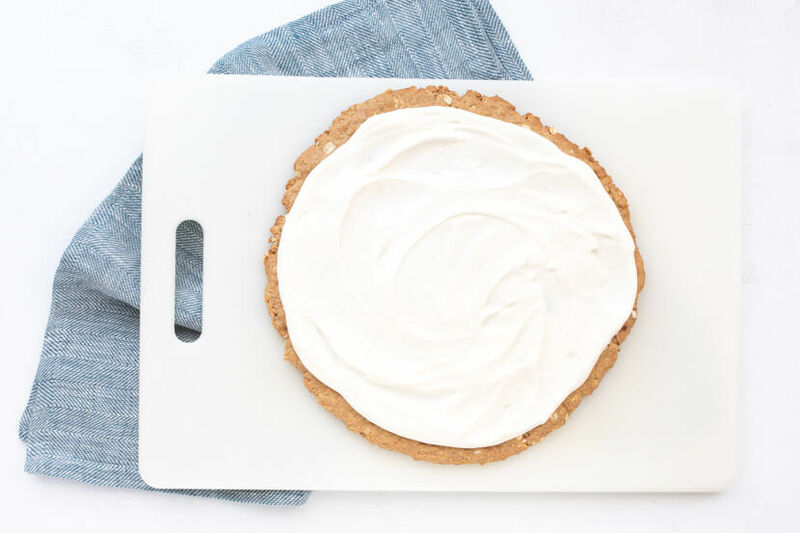 It’s the perfect dessert for entertaining or sneaking in some extra fruit, dairy, and whole grains. Best of all, this dessert pizza can be made with your kids! Make the “crust” and the “sauce” then cut up some fresh fruits. 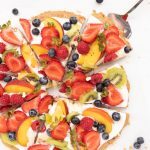 Let your kids decorate the pizza for a fun family activity.This fruit pizza can be made for any occasion. Use red and blue fruit to decorate it for the 4th of July or write a special message on the top. Get creative and have fun with it! 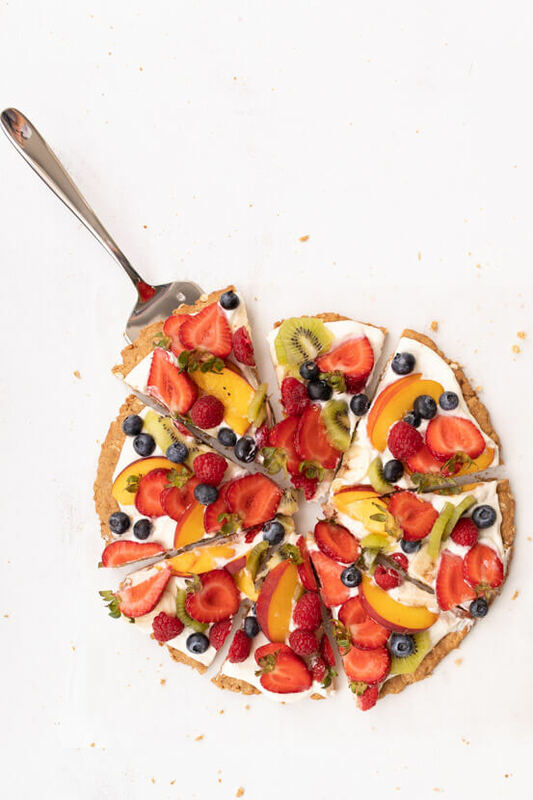 This fruit pizza gives the classic sugar cookie crust fruit pizza a healthy twist. In place of the sugar cookie crust, I made my own whole wheat oatmeal cookie crust. 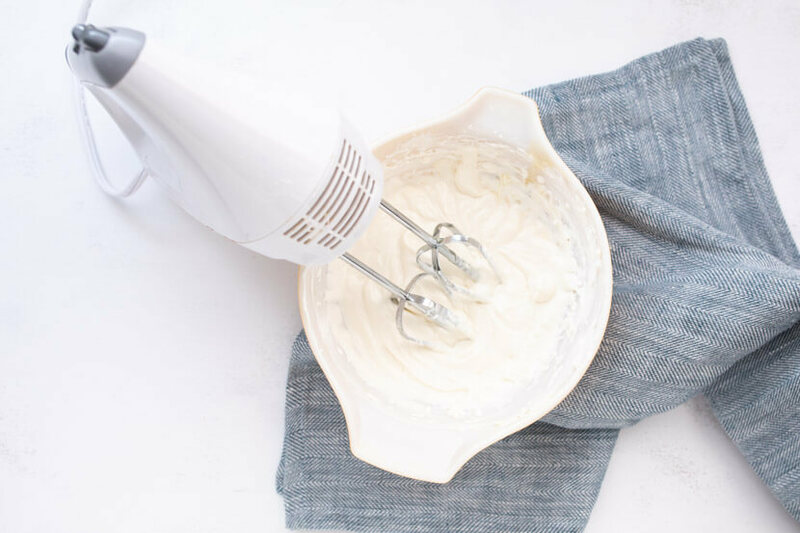 For the cream cheese icing, I whipped up a lighter version made with non fat plain Greek yogurt (sneak in a little protein too). I promise, no one will be missing the old version once they taste this! 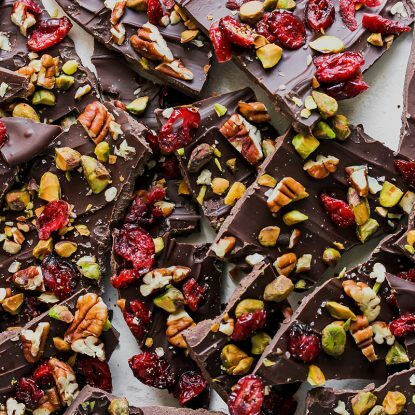 Get the full scoop in the recipe below. Preheat oven to 350 degrees and line a round pizza pan with parchment paper. 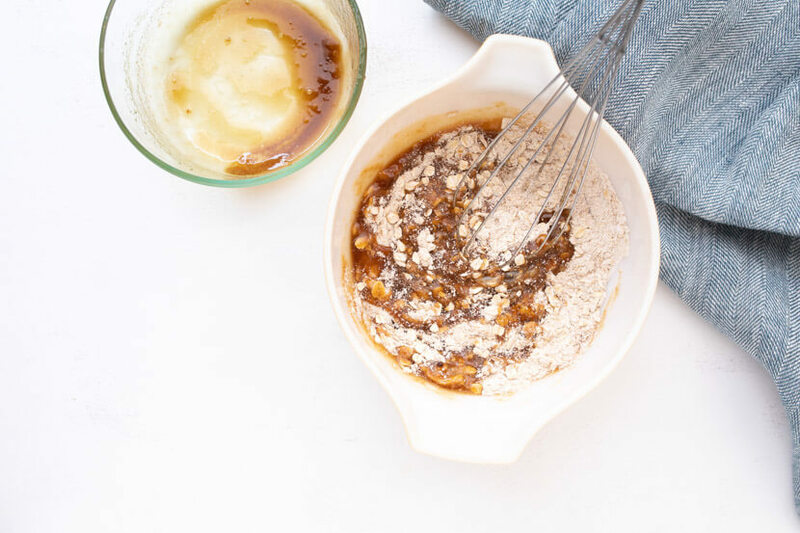 In a large bowl, combine flour, oats, cinnamon and baking powder. 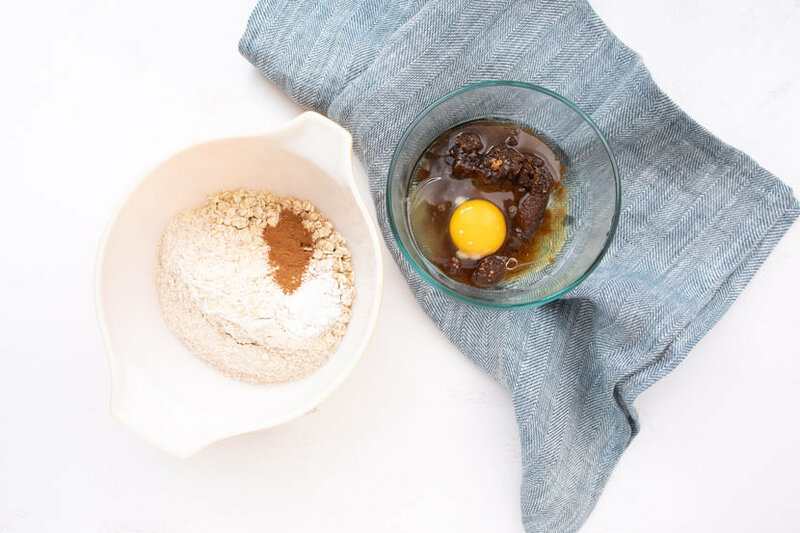 In a small bowl, whisk egg, brown sugar, vanilla, and oil. Add the wet mixture to the dry mixture and stir until ingredients combine. 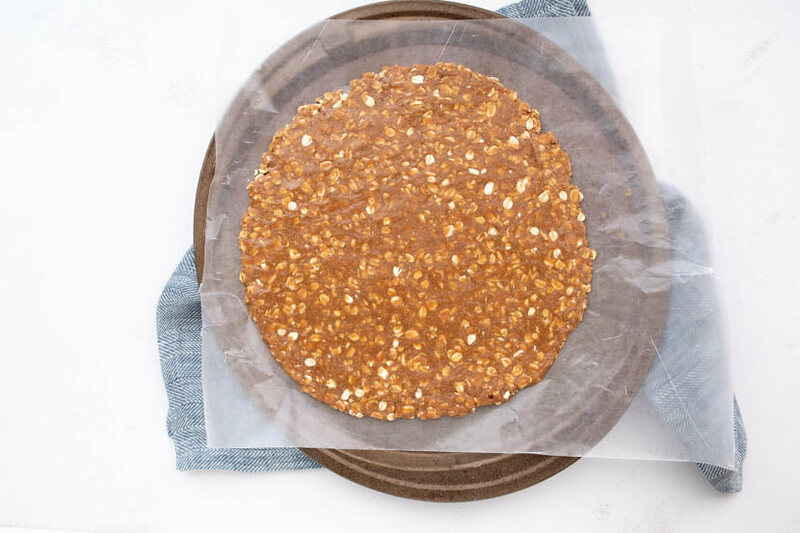 Pour batter onto pizza pan lined with parchment paper gently spreading into a circle. The dough may be too small for the size of your pan. 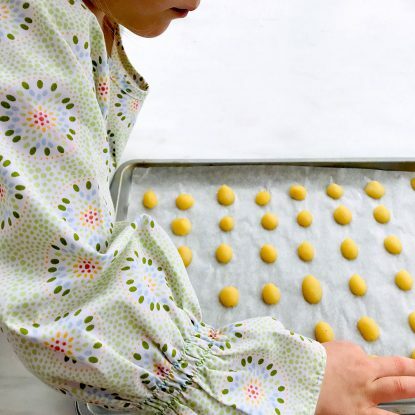 If so, just form the dough into a round shape. Bake for 10 minutes or until the "crust" is golden brown. While the crust is baking, combine Greek yogurt, cream cheese, and sweetener of choice in a small bowl. Allow crust to cool then spread yogurt mixture on top of the crust and decorate with fruit. Too delish! I could eat the whole pizza but I’ll practice Self control…for now. This was great! I made it for a large crowd so I doubled everything and added one diced apple to the crust. Out of all the deserts there this was the first to disappear. Right now I’m actually making just the crust and I plan on cutting it in squares for on the go breakfast bars. That’s great to hear! 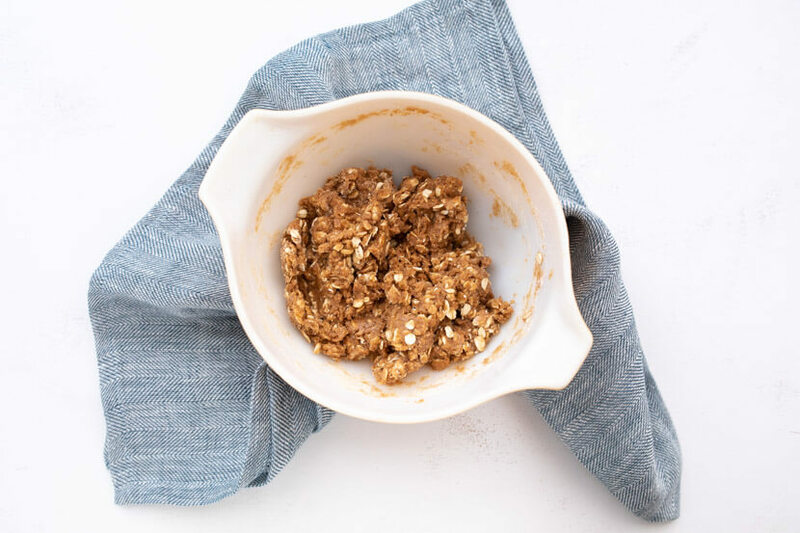 I love the idea of using the crust for breakfast bars! Enjoy! This was a great recipe but it would be nice if it could provide some nutrition facts. Great tip! I will definitely start providing nutrition facts on my recipe. I think it will be helpful. Hey! I’m hoping to try this recipe this weekend. If I double it, do I need to separate pans? What size pizza pan was using the original recipe? Thanks! Yes, you would need separate pans–much easier to double by making 2 pizzas. I used a 12″ round pizza pan. If I make this a head of time, how long does the crust last left covered and on the counter and how long will it last if I freeze it? You could make the crust, let it cool completely and then wrap it well in plastic wrap or keep it in some sort of airtight container for 2-3 days. You could freeze the crust (wrapped the same–keep it air tight) for up to 3 months.